Happy Saturday, I hope everyone is having a super weekend so far. Today I will be preparing a raw key lime pie and one of Ani’s new recipes for my nephew’s birthday party. My sister is having the event catered by a very non-vegan Mexican restaurant, so I had to pack alternatives to mountains of meat, cheese and kiddie birthday cake for myself and anyone else that would like to go lighter and fresh. :-) I’m excited about the key lime pie because it uses 5 avocados, you can’t go wrong! 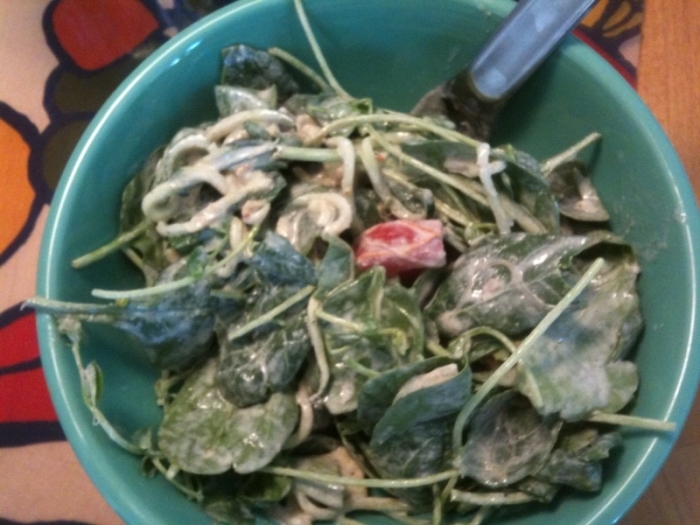 Yesterday, I remixed the leftovers of my hemp seed modified version of Gena’s Alfredo recipe for lunch by adding spinach, sprouts and other fresh veggies to soak up the extra Alfredo sauce. The sauce made a wonderful creamy salad dressing also and it was so simple, it would be great to make a batch of just the sauce, store in the fridge and use as a salad dressing and/or dipping sauce throughout the week. After work yesterday, I decided to go shopping at a store I had not been to in awhile – The Nugget, to mix things up a bit and stock up for the week and get ingredients for today’s recipes. Good choice because fresh California avocados were 2 for a $1. But, I noticed many other prices that were higher than Whole Foods in the produce, bulk foods and vegan meat alternatives. As well as pet food was considerably higher than Target. I was wiped from the day and decided to just deal with it, but I will probably be sticking to Whole Foods and Trader Joe’s in the future for stock ups. I also picked up a quick dinner since I knew I’d be doing enough food preparing over the weekend. Found these beautiful veggie rolls in the fresh sushi department for a reasonable price and fresh edamame next to them for a little protein kick. Good to know if I need a reasonably priced quick vegan lunch on the road. I’m off to the gym, then recipe prep and onto screaming kid madness! :-) Have a great Saturday! Those veggie rolls are beautiful indeed! Yum! And avocados, 2 for $1? You can’t beat that!! Yum!!! Those veggie rolls look so good!!! Can’t wait to see the raw key lime pie! 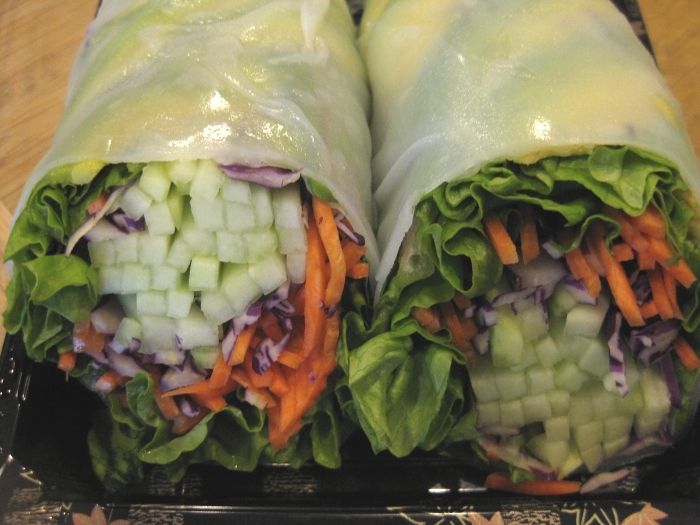 Mmm- I’ve never had a veggie roll, but they look awesome! i wish you were coming to my house so you could prepare a raw delight-so jeolous of your family. hope you had a great sunday!